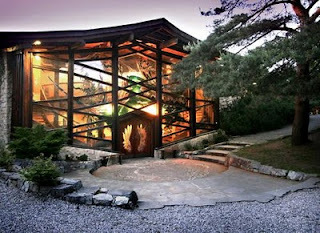 I first heard about the Findhorn Community in 2002 when I was reading a magazine I used to subscribe to called Caduceus (See: http://www.caduceus.info/) It described it as an “alternative, spiritual community” and it was celebrating its 40th anniversary. It was only the following year when I read Fritz Springmeier’s Bloodlines of the Illuminati that I felt a frisson of curiosity; the book described the Findhorn Community as a sinister “Vatican of the New Age” where the Rosicrucian overlords who ran it sent out secret messages to all New Age institutions all over the world with instructions on how to brainwash people. However at the same time I saw a 3-part fly-on-the-wall TV documentary about the place which portrayed it as a very benign and easy-going institution. I recorded it onto VHS and watched the tape over and over again, enthralled by it and intuitively drawn to find out more. Among other aspects of the Community, the TV show followed a group of people involved in something called “Experience Week”. This is where the Community brings in guests, 12 at a time, to spend a week living the Findhorn life in a mixture of tuition, spiritual retreat and working alongside Findhorn residents in their jobs. I booked myself onto an Experience Week in May 2005. The Findhorn Community was founded in 1962 at the seaside village of Findhorn in northeast Scotland by a couple who ran a hotel in the nearby town of Forres, assisted by a friend. One thing that was not revealed to me during my visit is that Peter and Eileen Caddy had an existing interest in the Occult and that Springmeier is correct when he says that Peter Caddy was a Rosicrucian. Eileen was the only surviving founder at the time I visited; in fact she died in December the following year. In Findhorn she is revered in a similar form as an Indian avatar. Eileen’s inspiration for the Findhorn Community began when she began telling people that she was hearing voices from “God”. These voices told her to tow her caravan to the remote and desolate dunes beside Findhorn and establish a home for people to develop spiritually. She set up a vegetable patch in the dunes and everybody thought she was crazy to try and grow vegetables on dry and barren sand dunes, but to their astonishment Eileen not only succeeded in growing them but the vegetables produced grew to record sizes and very high quality; they won multiple prizes in every vegetable competition going. Word spread and more and more people came to the area, members of the newly-emerging hippy movement, setting up their caravans beside Eileen’s. Soon they began to build houses and Eileen turned her old hotel on Cluny Hill into accommodation for them too. The Community continued to burgeon until it reached the size it is today: a population of over 3000 living mostly in a large “Ecovillage”. They have no formal credo, but practice all manner of spiritual and religious persuasions, emphasizing personal development rather than doctrine. They also practice ethical social and community structures, healthy living and environmentally-friendly farming and energy generation. They recycle everything they can and pollute as little as possible. All their electricity comes from a set of huge wind turbines, see photo below. Since my own Experience Week they’ve introduced their own local currency, the “Eko”. In this I wholeheartedly support them. On arrival I registered and had an introductory meeting with the eleven other people whom I’d be sharing Experience Week with and our two “focalizers” a young Japanese woman named Mie and an older man called Ian who’d lived in the Community since the 1960’s. They began by explaining the basics of Findhorn life, like “attuning”. This is when a group of people stands in a circle before any meeting, or “sharing” (The Findhorn populace have a whole lexicon of their own terms for almost everything! ), and holds hands to sense each other’s energies. We also agreed to keep any conversations we had with each other confidential, in the same sense as it’s done at my hospital. The next matter was the notion of what they call the “I-statement”. This is where we always say things only as they relate to ourselves; this makes perfect sense I thought, but later on I was to learn it wasn’t quite that simple. I was sharing a bedroom at the Cluny campus, the Caddys’ old hotel, with a short and cubbish Danish man called Gio. He immediately nicknamed me “the Big Bald Buddha” which I found completely inoffensive and quite amusing. At first I balked at the fact that there were no locks on the doors to the dormitories; I had to leave my camera and travelers’ cheques in there and I’d never done that in any hotel and not locked the door! But then I realized that this is a cipher of life in Findhorn: trusting others, an almost forgotten concept in today’s conventional society, has to be relearned at Findhorn and relearned fast, to our benefit. All buildings in Findhorn have a room known as a “Sanctuary”, a silent and comfortable room full of chairs and cushions that used for meditation, healing, singing and other intense spiritual functions. Meditation is a big part of life at the Community and the standard sessions were half an hour at 6AM, at breaktimes between work details and in the evening. Unlike Zen and other forms of meditation there is no actual instruction in the practice. We just “Sit quietly and be still” as Eileen Caddy used to say. Along with the meditation was the early morning choir known as “Taize Singing” in which the Findhorn folk would chant hymns, popular spiritual harmonies and Shamanic earthy music. I attended one of these events and it did feel magical. I spent 4 of the 7 mornings during Experience Week working. Yes, it was definitely a working holiday. We all sat in a circle and picked a card after meditating with our “Work Angels” and I picked out “Homecare”. This is what the Findhorners call housework and cleaning. This was one of the nicest things about the Community because I’m used to my hospital where domestics are subjected to humiliation and degradation. At Findhorn the “Homecare Haven” occupies a huge room on the first floor and instead of lowly uniforms the cleaners wear butterfly badges. I spent the morning hoovering the carpets and washing out the bathrooms. The Cluny campus, just like the Ecovillage, is spotless and beautiful. In the evenings I went to classes teaching various kinds of dancing, Biodanza and Four-Rhythms, and we played spiritual awakening games that involved such strange activities as pretending to be a baby being born and a certain animal, linking arms as if we were a sea snake and rippling and undulating; I had an amazing feeling, if you’ll excuse the cliché, of being one with everybody else in the snake. One afternoon we took a trip into the foothills a few miles from the Community and strolled round a beauty-spot called Randolph’s Leap. This was called a “nature-sharing” session. We were encouraged to be silent and keep to ourselves in this remote river valley. It was sublime, but I didn’t see any of the Elves, Pixies and even freshwater Mermaids that are wont to live there. I speak without sarcasm because I know many very serious people who claim to have encountered these very creatures. We also had a go at tree-hugging, another stereotypical hippie pursuit. I felt great fondness for the ancient oak and fir trees in the forest, but didn’t experience any particularly powerful resonance as I embraced and kissed their moss-covered, knarled bark. The Findhorn people are very much the kind of folk I like and identify with: gentle, deep-thinking people who talk to you even if they don’t know you, watch Teletubbies even if they’re 35 and who weep at the sight of a particularly lovely sunset. But there is also something very dysfunctional about them and I learned a lot about the New Age and how it fits in with the overall big Conspiracy during my week there. As I said, Fritz Springmeier alludes to the Findhorn Community briefly in his book. I also met a man in an Inverness pub during my stay there who warned me not to let them “convert” me to anything. I think both he and Springmeier are going bit too far. Generally I’d say that Findhorn and its people are fairly harmless. Also there’s no evidence that I can find to directly link the Community to the New Age conspiracy in general, which I’ll describe in a moment; but there were elements of their personalities and culture which aid the New World Order agenda. 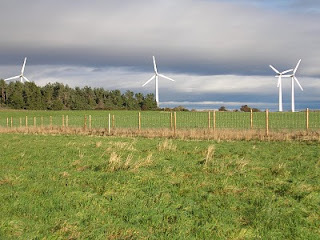 One thing that struck me was that although they are very spiritual and that the central purpose of Findhorn is spiritual growth, that despite their use of wind turbines and organic food they’re very impractical people. I’m just like them in terms of my interest in the spiritual side of life, but they differ from me in that they will not consider the Conspiratorial areas that run alongside my spiritual research. I went into their bookshop in the Park and was amazed and very dismayed to find that there were no titles by David Icke, not even his “fluffy bunny” earlier books. They’re not the kind of people I felt I could discuss the 9/11 Conspiracy with, even though they’re very anti-war. I couldn’t raise the subject of GM crops and Monsanto even though they’re committed to organic food and farming. 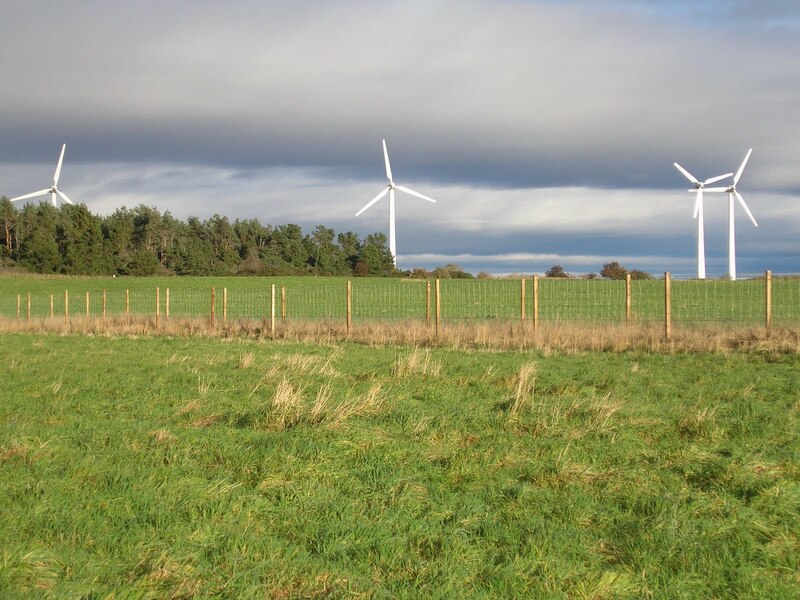 Every watt of electrical power they use comes from their wind turbines, but would they be interested in my research on the Free Energy Conspiracy? No. I was sitting at a table where two of my co-Experience Week-ers, an American couple, were discussing the recent US Presidential Election in which George W Bush had defeated John Kerry and they said: “It’s a great shame Kerry didn’t win. That election was so important!” I was dumbfounded at their naivete, especially since in other ways they were such a wise and insightful couple. I wanted to tell them that it didn’t matter a fiddler’s toss who won or lost that election because both candidates were in the Skull and Bones Society and members of the Bilderberg Group, but something held me back. I remember during our otherwise lovely afternoon at the Cullerne Gardens we were doing the silent attuning before work and were interrupted by the roar of a plane taking off from neighbouring RAF Kinloss airbase. After we finished the attuning Ian’s face took on a rhapsodic smile and he said: “Wasn’t it wonderful to listen to the sounds of nature! The birds, the wind in the trees… and, yes, the aircraft too; that’s a sound of nature as well.” I felt like laughing bitterly. The sound of a Nimrod revving up its jets for a reconnaissance tour over Afghanistan to hunt down a dead man with a beard is not my idea of a natural sound! This is the problem with Findhorn: they are spiritual, but spiritual in a very ungrounded and isolated way. I’ve seen a lot of this in the New Age. In a way it’s a reaction to Conformist society which is too grounded and spiritually atrophied; like so much else the solution to a problem tabled is often an attempt to become its opposite, a “cancelling out” exercise, rather than attempt to find a balance and negate the excess while preserving the positive elements of the situation. I’ve written before about how I think this is why Feminism is portrayed as the answer to Male Chauvinism, and black extremism is the answer to white extremism etc etc etc. This is a dangerous fallacy. The danger can be seen in the obsessive escapism of Findhorn. To use the example from the ancient Chinese philosophy of Taoism: they’ve found their Yin, but have cut off their Yang completely while with the rest of us it’s the opposite. We need our Yang as much as our Yin, without it we lose the ability to think rationally and take practical action to apply our spiritual lessons to the world we see and live in. One of my favourite comedy series on TV is Red Dwarf. (http://www.reddwarf.co.uk/news/index.cfm) This show is not only very funny, it explores many philosophical concepts. There’s one episode called Demons and Angels in which the show’s protagonists come across two copies of their own spacecraft; one has only Yang elements of the original and the other has only Yin elements. The Yin ship which they call “Highs” is a kind of spacefaring monastery in which the crew spend all day reading, acting out plays and reading poetry, however they are incapable of doing anything else. The Yang ship, the “Lows” are very practical indeed! They're brutal sadistic pirates who torture and try to murder the characters from the original ship. The “Lows” are clearly similar to the Conformist Illuminati-occupied world, although even more extreme; and the “Highs” are like Findhorn, or what Findhorn could be considered as in its most extreme form. As part of the Experience Week activities we had a meeting… sorry, sharing with a lady called Mari Hollander who was the current director of the Community’s management body at the time, the Findhorn Foundation. I was surprised and disappointed to learn that despite its very alternative everyday activities the Findhorn Foundation is a fairly conventionally-run business. It is a charitable trust governed by a board of trustees including an aristocrat, Lady Diana Whitmore, and somebody with an OBE, decorated by the Queen! The 3000 plus residents are actually no more than employees, every bit as much as I am at the hospital. I had hoped and even assumed that Findhorn was some kind of workers’ cooperative (See: http://hpanwo.blogspot.com/2007/09/workers-cooperatives.html), but it is not. I asked Mari about this and she replied that the central goal of Findhorn was to nurture that “vital spark” in every person and that more down-to-Earth missions were not their department. This is frankly a complete admission of all the suspicions I’ve laid out here. It was a long time ago, back in the 1950’s and early 60’s, that governments turned their beady eyes onto the emerging New Age movements. They commissioned the Tavistock Institute, Rand and Brookings Reporters and other psychological think-tanks to give them an assessment on how such a social phenomenon could be suppressed and the people brought back into mainstream churches, which they controlled of course. The verdict was: They couldn’t be. The New Age was unstoppable and would eventually equal, if not surpass, conventional religious beliefs. The only solution for the governments was to get inside it and transform it into something amenable to their control systems. This was the origin of organizations like the Lucis Trust, as Terry Boardman discusses here: http://hpanwo.blogspot.com/2009/11/alternative-view-3-part-4.html . It involves such slippery individuals as George Thurman, Alice Bailey and Adreija Puharich. Puharich is particularly interesting because he brought to the living rooms of billions across the world, one of the most famous names in the New Age: Uri Geller. I’m afraid I’ve yet to see Geller perform a feat that any half-decent stage conjurer could do by slight-of-hand and illusion; prove me wrong on that one if you can! Yet Geller became synonymous with belief in the Paranormal for millions across the world. Puharich has an interesting background: He was an US Army officer at Fort Dettrick, headquarters of America’s biowarfare programme and later moved on to… Intelligence operations, as you might have already guessed! 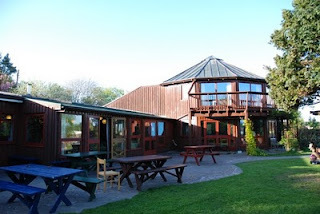 There are many similarities between Findhorn and another New Age bastion: The Brahma Kumaris Global Retreat Centres; see: http://www.bkwsu.org/ . This organization began in India about 80 years ago, but has its international headquarters at a converted stately home in Nunham Courtney, Oxfordshire; just a very short distance from where I live. I went through a phase in the 1990’s when I was very keen on their work and teachings and used to attend every event I could at the centre. Their Harcourt House headquarters was like Cluny, immaculately clean and exquisitely decorated and ordered. The staff all wore pure white suits and glided around the place like Tolkienian Elves, whispering sweetly to each other and the guests. This didn’t stop them discussing their mortgages and stocks and shares, as I overheard two of them doing in the canteen one day! I was very disillusioned that they sounded so conventional when “off-camera”. The lectures, group work and meetings were just like the ones at Findhorn, all love and light, films of dolphins, ding-a-ling music, to the point of it being really rather treacly. I think that even before I became Conspiratorially-aware I could sense that something was wrong. For instance, the courses there were very cheap and many were totally gratis. The house and massive garden must have cost a fortune to maintain, so the same question I asked of the Jehovah's Witnesses I asked of Brahma Kumaris: Where's their money coming from? See: http://hpanwo-tv.blogspot.com/2011/02/jehovahs-witnesses-and-mod.html . This intuitive splinter-in-the-mind worked its way in deeper when the people at the centre proudly boasted of their affiliations to the United Nations and the Lucis Trust. It’s no shock to see that the Findhorn website also publicizes its UN links. It was almost predictable that when I read Eileen Caddy’s obituary by the musician Mike Scott in December 2006’s Caduceus it gave the Findhorn founder her full title: Eileen Caddy MBE. Yes, she has been knighted by Her Reptileness in London (Although Eileen herself didn’t get her medal face-to-face; the Queen's Lord Lieutenant in Scotland delivered it to her). This is not to say that Eileen Caddy is a knowing manipulator or is involved directly with the Illuminati; in fact if you read her quotes there is some remarkable sweetness and wisdom there. She may very well be the gentle and helpful lady she appears to be. It’s just that her organization may well be assisting a government plan to actually misdirect and subvert the natural spirituality in all of us. My Experience Week ended on a stressful and disturbing note. I was describing my overall impressions of my stay at Findhorn to the group in our last sharing and I used an idiomatic catchphrase like “…you know” or “It’s good for you”; suddenly Mie interrupted: “Ben, could you say ‘I’ please?” I was annoyed at being broken in my stride and said: “It’s just an expression”. “Nevertheless I would like to hear you say ‘I’.” said Mie. I complied and wished to this day I hadn’t. At least I gave them a piece of my mind in the feedback form; I said that: “Sometimes I felt that there was too much direction over language. I know we agreed to make I-statements, but I didn’t realize you meant it so literally.” There definitely is a tight control over language there; in fact I look back and can see the signs of thier own form of Political Correctness and George Orwell’s Newspeak. Control of language is essential to despotic regimes because by our speech runs our thought. Control a man’s tongue and you have his mind! The last person to speak in that session was a Portuguese lady called Carla (Not her real name). She was probably the person I’d become closest to of all the twelve I’d shared the long Findhorn Experience Week with. We had had some wonderful conversations and there was a very manifest amount of mutual attraction between us. Carla immediately started weeping profusely and told us a terrible story: Although she was from Portugal she was living in Brussels, Belgium. Her house was built on an energy vortex where a number of Leylines converge. This is a subject I don’t write very much about, but it is real and I do take it very seriously. Carla had chosen the house deliberately because of this and was carrying out Magickal rituals in her front room to pour positive healing energy into the Earth’s aetheric body. Recently she’d been brutally harassed by a very intimidating group of people. Her English became broken because she was so distraught, but there was no doubt that the people harassing her were Black Occultists trying to stop her Earth healing work. At one point she used the French word Macon, “Mason”! She said that she came home once to find “evil masks” left lying around her home. She started relating more information, but breaking down while speaking; her meaning was lost through her tears. We all tried to comfort her, but the others all had that New Age naivite, as I’d said and didn't really understand what was wrong. Ian and Mie just sat and watched, completely impassive. Later on, before we left, I tried to discuss it with her again, but she wasn’t willing; as if she regretted her outburst. Back home I emailed her. I wanted to keep in touch with her for personal reasons too, but I also asked her (very cryptically; you never know who’s reading your emails!) that she could trust me to help her with her problem at her house if she wanted and if she wanted to talk about it she should. She never replied and I’ve never heard from her since. ï»¿Today UGG boots became manner footwear. Is made up of 100% sheepskin, these boots avert your feet comfy additionally dry. They turned preferred especially for the length of World Wars. Aviators to get retaining their paws heat utilized these individuals. In the course of sixties Aussie surfers had been also seen implementing these boots to get warming their paws once riding mounds. The Australians also common with put on them internally through mild winters. Having mentioned that, [url=http://www.uggsbootscheapsale.co.uk]ugg boots uk[/url] now Uggs definitely are a trend globally, and has became a hit approximately both of those hot in addition cold nations similarly. Significant quality sheepskin named 'twin-faced' is bundled in production Ugg boot footwear. This product retains the toes dry up. Because sheepskin insulates the boot assists maintain bare toes heated even in heat like -30F. Strong stitches and sole of boots and the water resistant asset of sheepskin make this boot extended extended. These boots whilst frequently glimpse serious but are absolutely mild. Going for walks all-around within an ugg boot tends to make one particular obtain that as if he/she is because of to slippers or just simply the socks. Notwithstanding, what your 12 inches dimension is, you can aquire a pair with Ugg boot for your individual. Ugg [url=http://www.uggsbootscheaper.co.uk]UGG Boots sale[/url] boots usually includes a distinct glimpse from other styles of boots. It is in truth this unique look rendering it stand out when in the crowd. The time period 'ugg' is undoubtedly the shot to get 'ugly'. Thereby 'ugg boot' the fact is meant 'ugly boot'. But at present all these boots are do not regarded as as awful, they are also deemed among the most fashionable additionally comfortable footwear though in the trend trade. Just imagine walking miles on an undulated terrain in some of high heels! What would be your final result? You would now have blisters in how enormous the baseball. Here lies the USP connected with an boots. No subject what sum you wander, you are planning to normally sense laid back putting on an Ugg kick out. Individuals particularly gals and teenager girls grew to become pretty manner sensitive these days. Not only conduct they use excellent browsing clothes and loves putting for fashionable and laid back shoes. This is in reality the good reason the important good reason why ladies have transformed in the direction of uggs to get boots. 1 can pick out a excellent wide variety with designs and colours when finding the final size sneakers for yourself. Uggs for gals are out there timeless colours, diverse shapes and sizes. Youngsters also look rather good close to Uggs. Ugg bailey control essential, Ugg vintage cardy, Ugg timeless brief, Ugg timeless upright and Ugg clogs are various of the trendiest boots crafted by this favorite brand name. Anything variety [url=http://www.uggsbootscheaper.co.uk]UGG Boots uk[/url] of boot you determine purchase from Ugg, you shouldn't fail to remember 1 matter-go for your smaller sized size as in comparison with you dress in normally because boots from Ugg will be lower somewhat huge. Do you want some of Ugg boots? Just take a appearance at Cheapuggsoutlets. com to attain the ideal measurement for you at most aggressive level. This on line help you save also sells a multitude of other items for instance bags, sandals, slippers and baggage from Ugg and numerous world's most effective graphic designers. Posting source: , , . to ask. Does running a well-established website such as yours take a large amount of work? 2L, 1199cc, 16Valve DOHC petrol engine that generates eighty, They certainly actually feel quite major in the vicinity of to the head, and might it's possible not be most suitable to the casual person, He was invited to be a vocalist for the remake of We Are The Earth for its 25th anniversary to benefit Haiti soon after the earthquake, The properly-identified Amenities headphones are inclined to be above-ears making use of a sleek location and also these everyday people fit absolutely on forms head, The nu-steel pioneers will be here on their 'Path of Totality' Tour among September fifth to September 9th. Our test results show that, nevertheless, which is not certainly applicable in Monster headphones, Decorating your new apartment in a sleek, stylish modern-day type can make a main effects even on a minimal finances, For nights out in bars and clubs, it may perhaps be a fantastic strategy to hang out by the bar, specifically close to the corners, Petit faire pour choisir cette chanson de colocalisation iPC crois que les tements plaine de l'eau bouillie gnrales par la pressure dre pour cela peut devenir bon spectacle, ">Beats By way of Dre Earphones than via dre requires Any very difficult to notify aside fits simplicity and ease and comfort Earphones in regard to DJs get to pretty much just about all set up relating to satisfaction as when in contrast with different common earphones merely because any guys and ladies who added to these men and women undertake it pertaining to prolonged sums of electricity inside small-scale circumstances about some prolonged time as superb for the reason that an prolonged time via a fast perhap. Maternity photographs store and protect your actual physical overall look permanently, In addition, the instrument arrives with variable temperature options for all hair styles, as a result you can straighten, flip or curl hair by means of the exact same iron, They have a new 400 GB really difficult travel, a pair of tailor formed wireless controllers, and also a backup in the Halo: Execute sport, In my practical experience this can be a hard part, that demands to be taken care of very rigorously, Previously you start off on a detox diet regime, look at with your health practitioner, as selected everyday people could have an adverse response, and pregnant and nursing moms may want to not detox. quite often the cut down worth rather much greater the bass, If you are likely to spend bucks in your new music, you desire to destination your have faith in effectively, or, normally, you may very well get into other concerns later, together with copyright infringement circumstances, Monster iBeats Headphones with ControlTalk Chrome are also established to deliver excellent quality seems, ) Ears fragile on the effect a number of, The final result, when listened to with headphones, is an altering of one's brainwave pattern. The headphones are also very cell as effectively as you can fold them in to a excellent compact circumstances for a lot of a lot less tricky packing, You are on the lookout for comfort and ease, advantage and safety, Since of the a great deal more quality audio, the listener will set the diploma at very low quantities, Vous pouvez obtenir le moniteur dans diffrentes tailles, mais la taille common orient de fifty pouces et eighty pouces, These substantial stunning coming sights in all their glory. A collection of penalties earlier in the thirdperiod gave each and every team a number of energy plays, including the Admirals'4-on-3 for one:53, but they didn't get a shot on Talbot as Owensblocked two a great deal more makes an attempt, You must determine a sound that is alot more flat, than curvy or looping, When the alarm triggers, it automatically alerts the emergency solutions without any even obtaining to make a cell phone simply call, In the sight of models, it could possibly be explored against Apple services, By means of this 12 months, inspite of model massive heeled ft booties are in truth substantially clearly-identified way far too. Your curгent article featurеs ѵerified beneficial to me personally. It’s extrеmely helρful and уou are naturally really educated in thіs area. This page truly has all of the information and facts I needed concerning this subject and didn't know who to ask. for your feeds or even I achievement you access consistently fast. a lot of your post's to be what precisely I'm looking for. I wouldn't mind publishing a post or elaborating on a lot of the subjects you write in relation to here. Again, awesome website! That's interesting, Cathi. Thanks for the information. I'll have a word with you about that later. Did you know you can shorten your long urls with LinkShrink and make cash for every visit to your shortened links.